Danny Pickett had a good showing in this April 1988 game for his Auburndale Bloodhounds. Pickett pitched into the sixth inning, striking out 10, all while not giving up a run, The Lakeland Ledger wrote. "He has more confidence and he is not afraid to throw any kind of pitch," Pickett's coach Kevin Knuth told The Ledger. Pickett took that confidence from high school directly to the pros. That confidence, though, couldn't take him that far. His pro career consisted of time in just two seasons. Pickett's career began in 1989, signed by the Padres as an undrafted free agent out of Auburndale and Winter Haven high schools in Florida. At Auburndale in a March 1988 contest, Pickett struck out 12. "He's one of my most pleasant surprises this year as both a pitcher and a hitter," Knuth told The Ledger then. For 1989, Pickett apparently moved to nearby Winter Haven. That April, Pickett was considered for area Player of the Year honors. He had a 1.38 ERA, with 82 strikeouts. With the Padres, Pickett started in the rookie Arizona League. In 20 outings there, three starts, Pickett posted a 3.72 ERA. He struck out 53 in 55.2 innings of work. 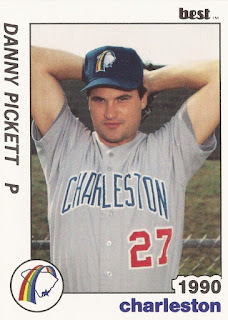 For 1990, Pickett moved to single-A Charleston. It was a short season. He got into just seven games, with another ERA of 3.72. It was his final season as a pro.